The notes about the individual plays and a study of the statistics hopefully give the visitor to this site a good idea of the history of the team.The text below is an attempt to illustrate the various stages of the teams progress and relate it to folk activities in the area, which may or may not also relate to the development of the folk scene in your area. An early picture of the first Four Champions play showing Rest of the World: Jim Mayer, St. Patrick: Chas Marshall, St.Andrew: Arthur Jackson (in winter combat camoflage!! ), St. David: John Burrell, Fool: Tony Harris and Rest of Worlds Assistant: Dominic Ward taken at Ripley Castle, Sunday 10th April, 1977. 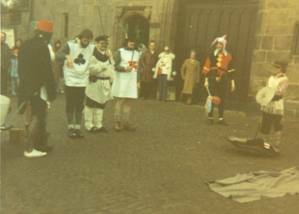 The Knaresborough Mummers were formed at Christmas 1974 by four members of Knaresborough Folk Club, held in those days at the Royal Oak, Bond End, Knaresborough. The intention was to perform a 'one-off' play for the Christmas party at the club. Richard Hardaker persuaded club organiser John Burrell that it was a fun idea and they sold the idea to two club regulars, Graham Bickerdike and Arthur Jackson to take the four main parts. Two other small parts were added to the Basic Hero Combat play, Little Devil Doubt and Beelzebub, enabling other participants to join in at short notice, the parts at first being taken by Dennis and Dominic Ward, then Dave Dearlove who was to become a team stalwart for the next twenty years. Due to the response other performances were arranged at local pubs over that Christmas. Further members were recruited and regular appearances started from Easter 1975. At the time in an approximate 12 mile radius of Harrogate, there were four or five folk clubs booking nationally known folk artists on a regular basis and several singaround clubs from Boroughbridge in the east of the area, through Knaresborough and Harrogate and out to Pateley Bridge in Nidderdale, not forgetting Ripon to the north. In 1974 clubs were thriving with the top artists coming to the area and there was no shortage of venues for the Mummers to perform in. As friends joined the team, their style developed based on a common love of Tony Hancock, Goons, The Navy Lark, Monty Python and whatever other zany humour there was about at the time. Jim Mayer started portraying traditional characters as recognisable comic figures and it was agreed throughout the team, that they would present the plays as if they were continuing to evolve. From the texts it seemed obvious that there was some humour therein and the presence of different characters from history indicated that contemporary events had influenced the plays over the centuries. Why not continue this process rather than perform the plays as a slice in time museum piece? Favourable local reviews in Tykes News, the local folk magazine, and then in a national magazine Folk Review following a performance at Whitby Festival, brought the team to the attention of Folk Festival and event organisers and the team performed at venues from Carlisle to Towersey and many points in between. Most team members at the time had the Mummers as their main folk interest so it was quite easy to respond to the variety of gigs that were available. The period from 1975 to 1990 could be regarded as the heyday for the team and there was a constant thirst for new material in those early days which mirrored the folk scene in general at that time. Since then, as members have moved on and the folk scene has gradually throttled back, regrettably no younger members have come through to fill the ranks, and current members have many other commitments, particularly to folk dance. However, the team has survived to the present day not only performing the Blue Stots over the Christmas period, but also resurrecting one of the longer plays when the occasion demands and members availability allows. Indeed, some of the plays have travelled abroad in recent years to Canada, Germany, Eire, Norway and Sri Lanka!! 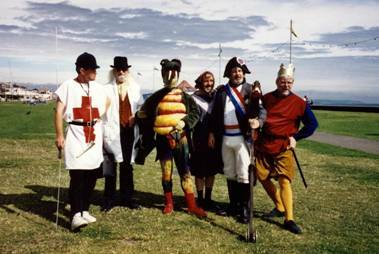 St. George and the Dragon in Bray, Eire with St. George: Jeff Garner, Doctor Ball: Peter Lees, Dragon: Martin Ord, Mother Molly: Mike Johnson, Napoleon: Doug Child, King Cole: Dave Williams.